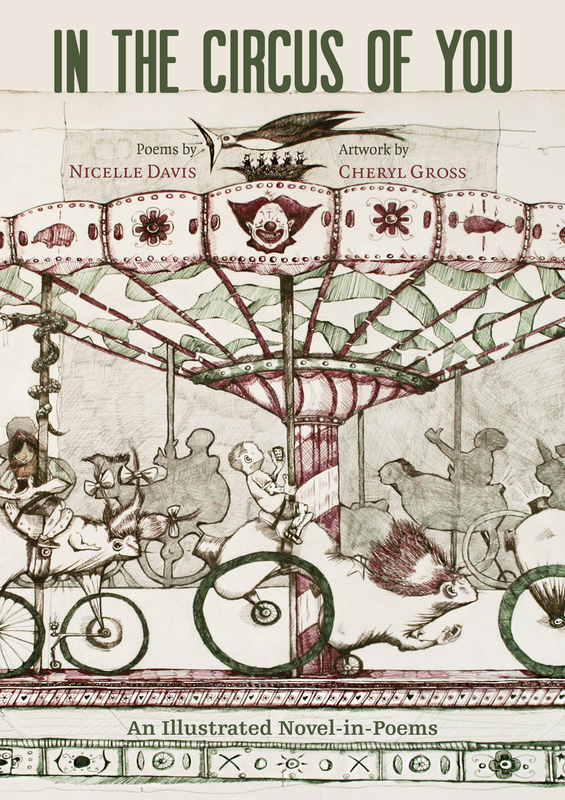 Book trailer for IN THE CIRCUS OF YOU: An Illustrated Novel-in-Poems by poet Nicelle Davis and artist Cheryl Gross. The book will be released in March 2015: preordering begins in February 2015. I am not a barker. There is no kiosk here to see. No ticket vendor. No brightly lit sign, painted hand or enormous arrow that points to this place. We are not attending the carnival or the midway but we are all gathered under the big top. We are the attractions. We view ourselves with equal parts delight and horror. Out in the Midway, as the ride begins, it slowly lurches forward with us tightly belted in to our seats. It is a journey that promises much; fear, anticipation, and joy all wrapped together. We are pulled past windows where we are shown carefully created dioramas depicting Oddities that somehow both match and outstrip our own imaginations and orchestrations. These tickets were bought a long time ago. Life is a freak show and all of us are participants. We jump from audience to performer as quickly as we wish to be separate from one or to belong to the other. We slide in and out of shadows, like shape-shifters of compromise. We contort ourselves in service of the pragmatic, the mundane, or the bigger whole. We desperately wish we were seen as the magician, sorcerer or conjurer of our own illusions. We are in awe of giants, coveting their power and perspective. We fear them for the same reasons. I don’t have a tattoo. I appreciate the art. Even more, I understand the need to make a mark or public display of being an outsider. The act of covering my skin with an image has just never seemed to fit with the desire to peel back and expose the truth of living in that skin. The broken knuckle from a forgotten fight that blooms from a finger is an awkward ornament. The scar that sits just above the knee from a reckless moment on a bike is a crescent moon drawn into the skin. Our scars, creases and configurations are the art that history makes of our bodies and illustrates our humanness. As with any good sideshow, if we are lucky to look long enough, we end up seeing each other. We are a lucky audience to find ourselves in what is revealed in others. As we catch our reflection in the peripheral mirror of vision, we recognize ourselves in the performer’s knowing gaze. We are what we are delighted by, when we are invited under the flap of the sideshow tent. We are freaks. Cheryl Gross is an illustrator. Nicelle Davis is a poet. They met through the publication, Broadsided, which puts visual artists and poets together to collaborate and create literary-posters that are distributed across the world. This process of collaboration almost always results in a revelation for each, because poets can’t anticipate what an artist will see in their words and the artist is always surprised by the power of words to suggest the image. The power in this particular partnership illuminated and infused both the words and the images. The words are twined with the illustrations as though the poet and artist are sharing the same soul. As with conjoined twins the two share “In the Circus of You” as an expression of a unique bond that creates an additional intimacy, as though sharing arms, legs or a torso. The collaboration you hold in your hand is joined by all of us who hope to recognize each other in our search for what makes us beautifully human, joyous in the expression of our differences and willing to celebrate the intrinsic connections between us.